Today I head home. I am excited to see all of the people back home who care about and miss me. We had some debrief to wrap up today, but all in all it was a relaxing day at th office. It was cool to just hang out with the crew in the last few hours before we separate. It is kinda sad to think that we will likely never all be together again after today. At around 1:00 Dennis, KB, and I were shuttled to the airport. Now I sit here waiting for my flight to take me home. I hope you all have enjoyed my blog. Thanks for reading. This really has been the summer of my life! Today was crew debrief, which I found is really code for take the decals off the vans, and clean the vans. I have to admit it wasn't the most fun, but spending this last day with my friends that I have made this summer was great! Since we were at headquarters I got to visit the museum of Pi Kappa Phi history and saw some really cool stuff! The Mug Wall, there is a mug from every university that has a Pi Kapp chapter at it. If the mug is right side up the chapter is open, if it is upside down it is closed. When you visit you can write a note and put it in your mug. The fraternity TKE opened a special chapter for Durward W. Owen, of which he was the only member. This was because he was their insurance agent, but they were not aloud to have an insurance agent who wasn't a member of TKE. Kinda a unique history there. The fraternity went through almost 2 decades where no new chapters were founded. This was the saying the Durward W. Owen used to get the organization through the tough time. This is the seminar room the Bruce Rodgers dedicated to Todd Porterfield who died on the Journey of Hope in 2000 and Jason Tirado who suddenly died shortly before beginning his second Journey of Hope. Mae did have an actual debrief were we discussed with the staff things that could be improved about the trip. It seemed really productive, and I hope that some of our feedback will be applied next year! As the day drew to a close at the office we went out for our last dinner as a crew. We went to a local pizza place that was really good! After dinner we hung out on the town for a little bit, but ended up turning in kinda early because we have to wrap up debrief tomorrow morning. Today we woke up early after a long night of celebrating and saying goodbyes. The crew has to drive to Charlotte where Pi Kappa Phi headquarters are for debrief. Our first stop of the trip was iHop where we had a delicious breakfast! We then took shifts driving the 400 miles to Charlotte. It was crazy being on my last long can ride with these guys who I haven't been apart form for almost 3 months! We made it to Charlotte and went to our hotel for the next two nights. It was pretty nice, it was cool to get to spend some real quality time with the crew. We went out to dinner at Tavern on the Tracks which was really tasty, and it had a sweet view of the skyline. Then we went to bed to get ready for debrief tomorrow! August 8 - Washington D.C.
Today was the big day. Our amazing journey across the country was set to come to an end on the West Lawn of the Capitol Building! We woke up bright and early with very little sleep, but it didn't matter because today having sleep didn't really matter. We were all so excited, the whole day just flew by. We had a ten mile ride to get through before we stayed up for arrival. We got out there and marked every single turn to stage up it was such a short ride. The hardest part was finding a place to park. We arrived at stage up which was on a lawn at George Washington University. We got there first, and shortly after Build America showed up. Quite a while later the other two routes showed up. We waited at stage up for quite a while. We circled up with all the teams and staff members and said one final team prayer. We then circled up with our team and said some final words and got pumped up. Next we had to figure out how to get our 9 crew members on my van which was driving in the arrival. We squeezed in, and got rolling directly behind the cyclists! It was a surreal way to see Washington D.C. for the first time. We passed the Lincoln Memorial, the White House, and Washington Monument, and then turned to see the Capitol. A wave of feelings hit when we saw the Capitol for the first time. There were crowds of screening parents, so supportive, I felt like a super star! We got out of our van and walked through a path in the crowd to the lawn. 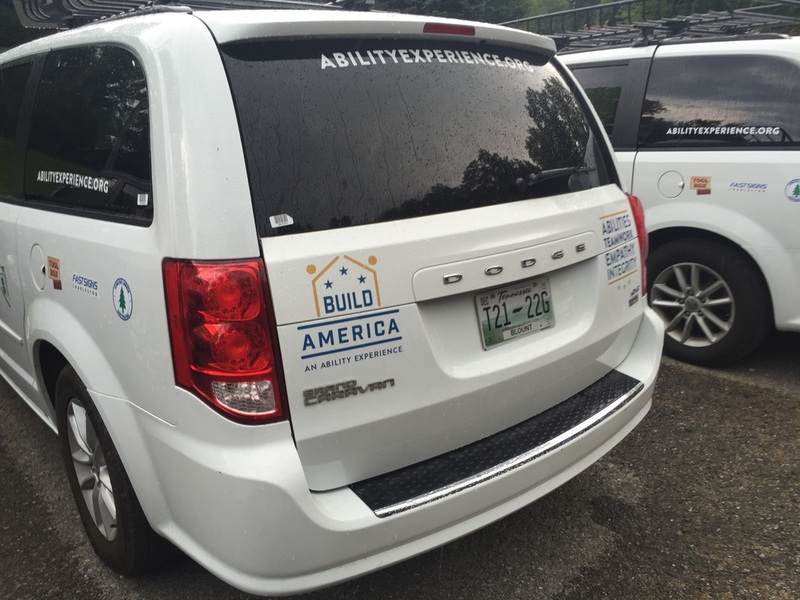 The Build America team was already in picture formation and we began to line up beside them. We turned and saw the crowd of supporters eager to hug their children who had been gone all summer, the funny, and supportive signs, and the smiling faces. The CEO of the Ability Experience "Basil" spoke, and then invited Mark Timmes the CEO of Pi Kappa Phi to speak. The Project Managers for each route then spoke. It was really emotional, it really hit us that this was the last time that we would ever be together as a team. I may never see some of these guys, who have become my best friends, again. After we took our team pictures, the families rushed into the lawn and many hugs were given and photos taken. I found Ryker my chapter brother and we hung out a bit before leaving. We made sure to thank Kevin Bachar who convinced us to do summer events back in January. We went to the hotel, and then headed to "Orphan Lunch" where the parent ambassadors took us to Johnny Rockets. After lunch Ryker and I went to the National Postal Museum. I was surprised by how big and cool the museum was! Once we got back to the hotel some of the North team was gathering in a hotel room to celebrate. We said some of our last goodbyes, and then headed to the banquet. The slideshow they played at the banquet was super emotional. This truly was our last time doing anything as a team. After the banquet a lot of people went to dinner, and then out to celebrate on the town. I went with Kyle Marpe and his girlfriend Justine to dinner at the Dubliner. By the time we were done eating the place was packed with people from JOH and BAM. It was really cool to see everyone celebrating together, even staff and the CEOs from the Ability Experience and Pi Kapp came out. Ryker and I left The Dubiner and walked to the Lincoln Memorial and the Jefferson Memorial. It was a long walk. We sat on the steps of both memorials looking towards the illuminated Washington Monument and reflected on our summer, and the year to come. We then walked back to the hotel said goodbye for another two days, and I headed to bed. Today marked our last full day together as a team, as tomorrow our journey ends on the lawn of the United States Capitol building. The guys were taking it extra slow on the ride. They wanted to savor every last moment, there was a point where we almost had to rack them to lodging, but Santi and I fought for them to get to finish their ride. Our last lunch as a team! Once at lodging we had to pack up all of our no-essentials into our duffel bags and load them into the Project Manager Van to be taken to tomorrow's hotel. We then put on our Pi Alpha shirts and headed to all team dinner. At all team dinner, at all team dinner the North, South, TransAmerica, and Build America converged for dinner. We practiced taking a photo with all 4 teams for when we arrive. I got to see Ryker once again, but we didn't talk much as we are both trying to spend as much time as possible with our teams in these last days. After dinner our vans were free to go get ice cream. So we did. It was crazy going on our last ice cream run as a van. When we got back to lodging we started signing shirts for everyone. The cyclists started cleaning their bikes for arrival shortly after. We ended the night with confessions, where everyone told the team the things that they had done that broke the rules. It's going to happen, and it is cool that at the end we can share all of those moments. Then it was time for bed. We have a big 10 mile ride tomorrow! Today was a pretty smooth ride. It is crazy to think that it was the second to last real day of riding. We arrived at lodging and had a little free time before our last friendship visit of the summer. The visit was pretty fun, we went swimming with some clients, and then had dinner. After the dinner we were told to leave lodging so the leadership could set up for the Pi Alpha ritual. For those who don't know, anyone who completes an Ability Experience Summer event is initiated as a Pi Alpha. We came back and had the ritual. I can say it was really cool, and we were up pretty late. The rest is a secret. While reflecting on the summer today it really hit me how far we have come. 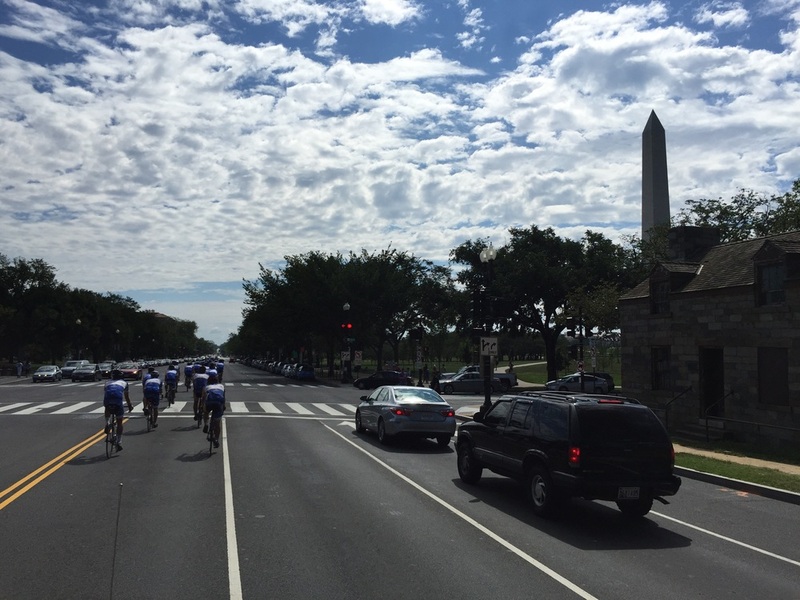 Over the last 2.5 months my team has cycled over 3000 miles across the country. I have made countless friends and it is going to be tough to say goodbye to them in DC! I didn't take a single photo today sorry! Today was a total throwback to the Rocky Mountains. We had 8000 feet of climbing over 65 miles! This mean that you would get to a crew stop and wait for sometimes well over an hour! One thing that is quite different about the Appalachians compared to the Rockies is that when these roads were build switchbacks had yet to be invented. This means that the grades on the hills are really steep. The downhill right after one of my stops was 13%. I hear the steepest of the day was 16%! Exactly half way through the day we crossed into the last state of the trip Maryland. It's crazy to think that I won't be crossing another state line before DC! When we got to lodging we had a little free time before we were to start a major van clean out. While I was waiting a shaved ice truck drove by. After the long day I couldn't resist so I bought a delicious shaved ice, and I got a free lei. We then cleaned everything out of the vans and put all of our belongings into our bags where they will stay for the rest of the trip. Cleaning out the vans started to really make the end feel real. We had our final team meeting in the evening. It was a ton of fun. We flew through all of the normal topics and moved into our gag gift exchange. I got a gift card to Chili's so that I can try something new. I also receive the team award "most likely to be made uncomfortable by watching the food network." Our final team meeting was a blast, and it really will be one of the memories that I carry with me for a long time. I can't believe that things are coming to an end! Today we made the trek from Pittsburgh to Uniontown. Getting out of the city was pretty complicated, and our directions were wrong so we didn't start out to great. Once we made it out of the city the remainder of the ride went by quite smoothly! We arrived at the YMCA which is where we were staying for the night. We then immediately loaded up in the vans and headed to our team activity. Our team activity was White Water Rafting! Dennis, Zach, Connor O'Neil and myself were in a raft together. It was a ton of fun, I can't believe I have only gone once in Idaho. Connor went overboard in the Rapids once, and we got stuck on a lot of rocks, but other than that we got through the river just fine. About midway through the raft trip we camp upon a jumping rock, and we all jumped off of it once. It was probably about 20 feet high. I have never been cliff jumping, and it was pretty intense (I know that's a pretty short jump). I'm glad I did it, but it was pretty scary! By the end of the trip our raft had made it to the front of the pack, and we almost missed the end beach. We paddled hard upstream and managed to make it to shore. After rafting we went to the local Knights of Columbus for dinner. We had spaghetti and meatballs which were quite delicious. The sponsors were so proud to be hosing us, they said they look forward to it every year. They called us in 1987 when they saw us on TV and said they wanted to sponsor us, and ever since they have. It was great to hear them talk about how we are the light in the world for them, and how proud they are to host a group of young men who are working for such a great cause. The support of the Knights was just what we needed to get through the last few days of the trip! After dinner I made a Walmart run to buy a few more stamps, and I went shopping for the Crew Chief lunch tomorrow. Today was nice and relaxing! We had an additional day in Pittsburgh which mean that we got to sleep in a bit! We rolled out to our first friendship visit of the day at 10:00 am. We showed up at CLASS (which is an acronym for something but I don't remember what) and were warmly welcomed. Most of the clients here were in wheel chairs which surprisingly was a first of the trip. I met a nice lady in a wheelchair named Helen who was non-verbal. She typed on a communicator to speak. She told us her story that she was the victim of a hit and run, before her accident she was a waitress in town. It was really sad but also really touching. This was probably one of the hardest visits to leave. We then headed to do another streetwise fundraiser. We only had about 15 minutes to spare, but in that time we made aver $200! We then headed out to our second friendship visit that was at a camp that Build America was working at. This mean that I got another opportunity to see my chapter brother Ryker. The BAM team was having a really good time, and it is clear that the camp culture is fully ingrained in them. We went out to the sports court and Ryker, KB (from BAM, he convinced me to do JOH), and myself played tennis with a girl named Angel. We bounced the ball around and you could really see that she was having a good time. It wasn't too long before we had to leave though. I said goodbye to Ryker, but this time for only 4 days as we will be in DC for arrival! 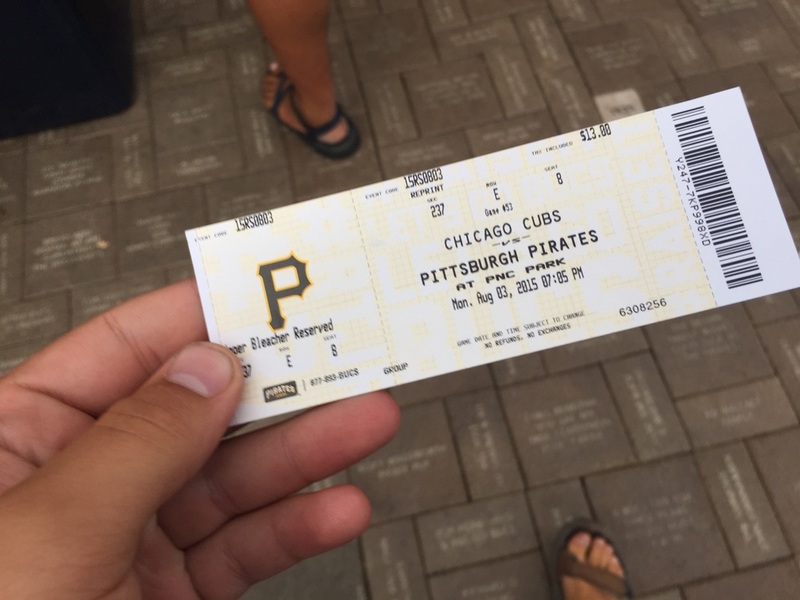 Finally we headed to a Pirates game which was sponsored by the 2005 JOH North route! Of course immediately after we got to the stadium it started raining and they had to delay the game. We waited and ended up getting to watch two innings before we had to leave to get back by curfew. It was a lot of fun! Today we crossed into Pennsylvania! It was a pretty hilly ride because we are now in the Appalacians. From what I've heard the rest of the ride will be really tough terrain for the cyclists! We also saw more Amish people which was pretty cool. Riding over the last hill and seeing Pittsburgh in the distance was pretty cool. They have an amazing skyline! We had lunch in a park in the city which was nice. There was a really cool building overlooking the park. You can really see how much more history the cities on this side of the country have. We headed to dinner at another park that was more secluded. I got to play a game called washer toss which was quite fun. After dinner we headed to yet another park for desert. I know it sounds crazy (because it was). We had another family sponsoring desert so that's why we moved. Later Santi and I went out and explored the town since we have a late wakeup tomorrow. It really is a cool town. Today we woke up with too little sleep and got ready for our ride to Niles. Nobody was in an amazing mood, but we got out there. Today turned out to be a really fun day. The highlight of my day on the road was driving through an Amish community. There were horse and buggies on the road and even "share the road" signs for them. It was a culture that I never thought I would actually witness in real life! We got to Niles where we were staying at a high school specifically for people with disabilities. They had prepared us fried chicken for lunch which was absolutely delicious! We had a little free time between lunch and our friendship visit with the Fairhaven Foundation. I used this time to draw our route onto a map. I plan to have all of the guys sign the map at the end of the trip. The friendship visit began and these people were exceptionally excited to see us. I think we've kinda gotten used to being superstars at these visits, but today was a great opportunity to step back and remember the impact that we are making! I hung out with a guy named Ray who is in a wheel chair. We danced, and talked and had fun the whole visit. After the visit we went to Olive Garden for dinner, I must admit that I had a few too many breadsticks! We then had a few more hours of free time. I used this time to sleep. I woke up at 8:00 in time for leadership development. We wrote nice things about people on our team and they were delivered anonymously. It was great to read some of the things people have noticed about me. We then were read a poem written by T.J. Sullivan who is kinda a legend in the fraternity. It really sums up this journey, and reminds us why the Journey of Hope is such a life changing experience. "For some, fraternity is a house. A structure of walls and rooms where men live and pass time. But my fraternity has no walls, except perhaps the rock walls of Loveland Pass at the Continental Divide, or the walls of corn in Iowa, the skyscrapers in Chicago, the orange girders of the Golden Gate Bridge, the relentless climb of Kirkwood. For some men, fraternity is a collection of photos on a wall. But for me, it’s the photos taken by the disposable camera I keep in my back jersey pocket. It’s the photos taken in front of the welcome signs as we cross state borders. It’s the countless snapshots taken with clients with smiles so wide you can see every tooth and most of the gums. It’s the fireworks on the Fourth of July in a corner of America I’ve never seen before. It’s the stories in the newspapers, and answering the same reporter’s question, “Tell me what you guys are doing exactly?” for the hundredth time. It’s shaving EVERY DAY, remembering to zip up my jersey, remove my sunglasses, tuck in my shirt, and smile for the photos that will hang in homes and offices for years after I leave this place. For some men, fraternity is in the parties or in a cup of beer. For me, it’s in the gallons and gallons of water that sustain me. It’s in spotting the support vehicle every five miles or so, where I can always count on a word of encouragement. It’s in the songs that play over and over on the FM radio stations that become the soundtrack of my summer. It’s in the faces of the kids who talk to puppets like they are real people. It’s in preparing meals or shopping in different grocery stores every day so that my guys will stay healthy enough to ride tomorrow. It’s in the children asking for autographs, and kind, incredible strangers who reach out to thank me for coming, when really, they are the ones who should be thanked. It’s in the cry of excitement I hear from the girl in the wheelchair as I ride up for the picnic. For some men, fraternity is the pin on the shirt or the trophies in the case. It’s maintaining my place in the pace line, making my way to the front, where the wind is stronger. For some men, fraternity is in the party that ends in the early hours of the morning. For my fraternity, it’s in the sunrises. It’s in those quiet hours in the Nevada desert or through the Ohio farmland when the world is asleep, and all you hear is the sound of a dog barking some distance away. It’s in my t-shirt that desperately needed a wash two days ago, and now is simply disgusting. It’s in smiling my way through my second or third flat tire of the day. For some men, fraternity is about impressing sororities. But for me, it’s in the cards and packages that wait for me at the next mail drop, especially the ones with the stickers and magic marker hearts all over them. It’s about the volunteer in Nebraska who hugs me like she’s always known me. It’s about getting our butts kicked in wheelchair basketball. It’s in anticipating the look on my mom’s face as I ride on the grounds of the Capitol, and the pride in my dad’s voice while he waits patiently for mom to let go. 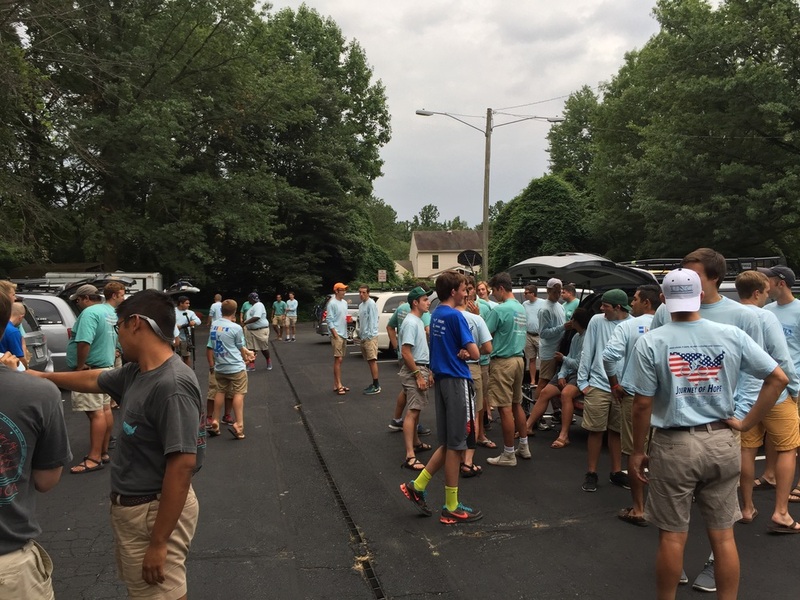 For some men, fraternity is about getting another event t-shirt. But for me, fraternity is forgetting that I’m standing in front of a few thousand people in a baseball stadium, wearing Spandex. It’s riding next to Bruce Rogers into Denver, pinching myself because I’m riding next to the guy who started it all. It’s in the phone calls from my girlfriend who understood how important this was to me. Or, in the admiration of my chapter brothers, and my real-life brother who thinks I’m cool. It’s dancing with the young woman with the walker who makes me blush when she shamelessly hits on me. For some men, fraternity is about pledge class unity, or leadership positions. But for me, it’s glancing in my left rear view mirror for the first cyclist to appear as I wait alone on a roadside. It’s that moment when I realize that these guys riding beside me have become my family, and that soon this incredible journey will be a memory. It’s about those times when we get off the bikes and just look out at a piece of scenery so breathtaking that no one says a word. Then, one guy turns away to wipe his eyes with his forearm and says, “Let’s get back on the bikes, fellas. It’s about arriving at the end and wanting in some small way to turn around and do it again. Or in the relief in the eyes of the staff members and crew who have prayed every night for my safe return. For some men, fraternity is about four years. But my fraternity goes for miles and miles on two thin wheels. I’m a Pi Kappa Phi, and I have learned the true meaning of fraternity. I am a Pi Alpha." Today was a frustrating day for a number of reasons. Firstly being with a group of guys for 60 straight days is taxing, and you start to get upset about little things that you should let slide, this happens in all sorts of groups. The big reason my day started badly is because I got super lost on my way driving the van to breakfast and my gas was super low. It was really stressful. once we got to breakfast at the Children's Hospital where we would be for most of the day my mood started to improve. Our tour group had a cute little girl who had some sort of developmental problem with her back. She knew her way around the building and was in such high spirits. We went into the children's dialysis center and talked with the kids there. They were tired because I guess it is a really intensive thing to go through, but they also were very happy and had lots of questions for us. We ate lunch at the hospital and preformed our puppet show for what I believe was the last time. Also our mail came which was really exciting! We then had some more free time which ultimately le to more drama. Our fundraising crew member had scheduled a final push to get money on the street corner, however the team just wanted some free time. In the end we discovers that our signs had been destroyed so there was no way to do it anyways, but we had wasted all of our free time talking about it. This left everyone in a sour mood as we headed to dinner. Dinner was on a dinner cruise that was sponsored by the first ever project manager. The cruise was a ton of fun, and the food was delicious. I have a ton of photos. The only problem was that it ended at 10:30 which meant that we didn't get back to lodging until 11:30 and we still had to do ice and water. I got to bed at around 12:15 for a 5:00 wake up. Tomorrow is going to be rough! Today's ride into Cleveland marked Our 4th straight day of crew ride a longs as Santiago completed his redemption ride after being racked for weather 3 weeks ago. We thought the ride was going to be nice and easy because there was a 40 mile stretch on the same road that ran along Lake Erie. The problem is that when we reached Cleveland and needed to mark turns to lunch our vans were too spread out. It was a giant cluster, but somehow we managed to get the team through Downtown Cleveland! We had lunch at a mattress store which was interesting. Seeing the soft comfy mattresses made me miss home a bit! We then headed to our lodging at Case Western Univeristy. Then we headed to a park to have sponsored dinner. On our way to the park there was a closed road and we were detoured through the Hood which was kinda scary! Dinner was delicious, we played games and just hung out which was nice. Whenever we get to relax a little it is nice. After dinner we had some free time and didn't have to be in bed until 2:00 am because tomorrow is a day off. Some of us when out and explored the town a little, but I made sure to be back by 12:00 so I could get 8 hours of sleep! Sorry I didn't take any pictures today. Today we had a 70 mile ride into Sandusky. Dennis was doing his ride along today, which is pretty exciting! We racked the team 20 miles in the middle of the ride because we were not going to finish on time otherwise. It was really stressful, and the cyclists were not happy about racking so early in the ride. We got them back on the road at about mile 49. Every pace line including the one Dennis was in finished the ride. We had a friendship visit at a Yacht Club on Lake Erie! I can't believe that I have seen two of the Great Lakes! The visit was quite enjoyable, we danced, hung out, and had a water balloon fight! After the visit we headed to Cedar Point for lunch, and to spend the evening at the theme park. Right as we were finishing dinner it started to pour rain. We got in line for one of the big coasters, but they shut it down for rain. By the time the rain started to slow there were small rivers flowing through the park! Fortunately the rain did let up, and we were able to get on 2 of the roller coasters. We made in on Millennium Force which is supposed to be the #1 Steel Rollercoaster in the country! It was very intense and quite fun, the view of the lake before the drop was amazing! We also went to Celebration Plaza to watch the show. It was a very well put together production, I am really glad that we stuck around to watch it. They ended with the song "Uptown Funk" which happens to be the song that we have a choreographed dance to, so that was cool! Today was a simple day on the road. I was happy to be back on the crew riding in a van. I did notice a lot of things that I had never noticed before riding though. For instance how awful the road was for most of the ride. Big Mike did his ride-a-long today. He made it 42 of the 55 mile day before he couldn't go any farther. It was disappointing because the whole team wanted to make sure he finished, but he was concerned about his safety if he continued. We arrived at the University of Toledo Pi Kapp "house." It is in a Greek village so it is a university owned cookie cutter complex. It was a very nice facility, though it was kinda weird that the other half of the building was the Pi Kappa Alpha house. We had lunch at the house and then headed to the dorms where we were staying the night. Our friendship visit was at the Sunshine Foundation. We broke into groups, and my group visited the therapy horses. It was really cool, some of the horses were enormous! We then went to dinner at Connor's house which was a steak dinner. We also got our laundry done there for free which was awesome! Today was and incredible day, a challenging day, and a rewarding day. I did my ride with the team today, 65 miles from East Landing to Ann Arbor. Ryan Dooley let me borrow his bike for the ride today, which was really awesome because he has one of the nicest bikes on the team. In my pace line was Graham and Reed. They were very supportive the whole ride, and without them there is now way I would have finished the ride. Our pace line was given a pretty good head start so that we could get out there first and have the best shot of making it the whole way. For the first 20 miles the ride was actually pretty easy, I even pulled (was in front, which is harder because there is no draft) for a bit. At about mile 25 things got really tough and I didn't know how I was going to finish the ride! We pushed on though, and my pace line was very encouraging! Every time we could see a crew van in the distance my spirits lifted and we pushed hard to get there to take a break. I ate a ton of food on the road, and I drank a lot of water! I have to pee basically every 5 miles. At about mile 25 we were red flagged because one of the pace lines had an accident (not involving a car) and he had to be attended to. After being stopped for almost 30 minutes it was really hard to get back on the bike, but we had to. We only had 2 hours to make it 20 miles to rack point. Those 20 miles were the toughest of the day. The roads were incredibly rough, and it seemed like every time we got to the top of a hill there was another one. Graham actually rode alongside me and pushed me up some of the hills. We made rack point by about one or two minutes, we took a really quick break there and then got back on. About a 2 or 3 miles later we found ourselves red flagged again because there was a traffic accident that blocked the rode we were supposed to take into town. This time we were stopped by an A&W Graham bought me a cheeseburger and it was the most wonderful thing! After about 30 minutes at this red flag the crew had figured out a reroute and we were released once again. Some of the hills on this stretch were really had, but aside from them I was feeling a lot better on the bike, it just wasn't as hard. When I got to Santiago's last crew stop I ran into his sandwich board and fell over, thankfully into the grass. Once we got into Ann Arbor I rode in front the rest of the way to lodging. It was cool to roll in, and have everyone celebrating. This made me the first crew member to finish a ride along! Though Isaac rode 86 miles of a 100 mile day and Santi was racked because of lightning. It still is a cool accomplishment! I have absolutely gained some empathy for what our cyclists go through every day. I averaged 14 miles per hour for the day and hit a top speed of 25 miles per hour on a downhill. I also have to thank the sweeps (Cody and Nick) for helping to motivate me though the day as they aren't aloud to pass any pace line. The were upbeat and positive the whole day, and never got upset about me going slow. Once we got to lodging we had a sponsored lunch there, which I devoured, and then we headed to showers at the pool! I took what was probably the best shower of my life! We then went to a friendship visit with an organization that supports people with brain damage. It was a lot of fun. They had a video game truck for us to play in (I didn't get a chance to play) and a lot of fun outdoor activities. I got to play ladder golf with the president of the organization which was really cool. After the friendship visit Sergio took the team out for ice cream at McDonald's for breaking the in-route fundraising record! We've broken $11,000 raised! I also ordered some chicken nuggets because I was still very hungry. Then it was back to life as usual as we filled up our water coolers and headed to bed. Today we rode to East Lansing. After some productive conversations yesterday we had a very efficient day! We didn't have to stop a single red flag the entire day. It felt really nice to have such a smooth day! When we got to town we began to stage up for our arrival at the Helping Hands Respite Center. We arrived at the friendship visit, and there were a lot of awesome people waiting there to greet us. We had some BBQ food, and just hung out for a bit. Towards the end we Had a little dance party to show off our moves! Affer the friendship visit I agreed to do a ride-a-long tomorrow! That means that tomorrow I will be riding a bike 60 miles to Ann Arbor. Ryan Dooley agreed to let me ride his bike tomorrow since we are roughly the same height. Tonight I practiced clipping in and out of the petals (for those that don't know you "clip in" to the petals which locks your feet to the bike). It is the scariest part of riding because if you mess up you will fall over. During practice in the parking lot I only fell once so I am feeling good about tomorrow. Lastly we had our second to last team meeting. I was awarded the Clear Vison Goggles for performing well at friendship visits! It is pretty exciting because less than 1/4 of the team gets awarded them the whole year. Other than that I am just hydrating for the ride tomorrow. Wish me luck! Today we woke up at 5:00, but if felt like 4:00 because we just switched to Eastern Time. I was absolutely tired for the entire day! We crossed into Michigan but once again there was no state sign at the border! I had hoped to get a picture at every state border. We had quite a few reroutes and other outside factors that caused our ride to go very slowly. By the time we got to Kalamazoo all I wanted to do was sleep, but we had a friendship visit to attend. The friendship visit was at a bollards hall which was really fun. We played a few games of pool and got some snacks from the attached bar. This was the first year of this sponsor handling the friendship visit, and the said that they want to have us again next year. We then had a leadership development session where we talked about enabling others to act. It was pretty insightful actually. We specificly talked about looking for people who are not being included and help them to be involved whether it is on the bike, at a friendship visit, or in our free time! We finished the day with a trip to a doughnut shop in town. It was very tasty. We finally headed to our lodging that was at Western Michigan Univeristy in their residence halls. It was nice to have a bed, and my own room. We said goodbye to Chicago today. It is an awesome city, and I wish we had more time, but it is time to continue our journey. Today was interesting for a few reasons, firstly our project manager Kyle Marpe did a ride along today. It was exciting to see our fearless leader out on the bike. It also was a weird day because 40 miles in we stopped at a beach on Lake Michigan and hung out for about 2 hours. It was a really fun time, and the lake was absolutely beautiful. It is crazy seeing a lake that looks like an ocean! After the beach we started riding the next 50 miles of the day. We passed through a town with a nuclear power plant which was cool to see. Unfortunately I didn't get a picture of it. Something went wrong in the planning of the day however, as at about mile 70 we had to rack the whole team to get to South Bend in time for our sponsored dinner. Our project manager (who was riding) and our crew chief had quite a confrontation about racking the team because Kyle wanted to try to finish the ride. We racked into lodging which is at a private Catholic high school, it is probably the nicest high school I have ever been in. Then we went to dinner with The Knights of Columbus. The grotto was really cool. There were fire flys all around, and a peaceful quite. There was something just so serene about this space. Finally it was time to fill up water and go to bed. Once again we got to sleep in a little. I am really looking forward to a day when I can sleep until noon, and then do absolutely nothing all day. Today we left for breakfast at Whole Foods at 8:00 am. The breakfast was delicious. We then headed to our friendship visit at Envision Unlimited. The visit was pretty fun, but weirdly disorganized. We spent most of the time cooking burgers for the clients, and sitting in the shade because it was so hot. After the visit we had a double decker bus tour of the city. This was my first time ever on a double decker bus! The tour was really cool, we got to hear about the history of the city, and saw some amazing sights. I took a ton of photos! After the tour we had dinner at the Yacht Club of Chicago, needless to say it was really nice. The view of Lake Michigan was incredible. This is definitely a city I would like to revisit! Thank you for your interest in Pi Kappa Phi, you should hear back from us shortly! © 2016 Pi Kappa Phi -Idaho. All rights reserved.